With Kisuke Urahara being known for his means by the Quincy Force, he is known to be a powerhouse of information and knowledge. His ability allows him to come up 1000 scenarios before ever going in so he isn’t caught with his pants down. This happened during his latest battle against Askin Nakk Le Vaar as he even predicted him being pushed to his death, but used Nel as a safe bet. As the situation grew worse and worse for Grimmjow and Urahara, they became unable to move, unable to fight and unable to help Ichigo. 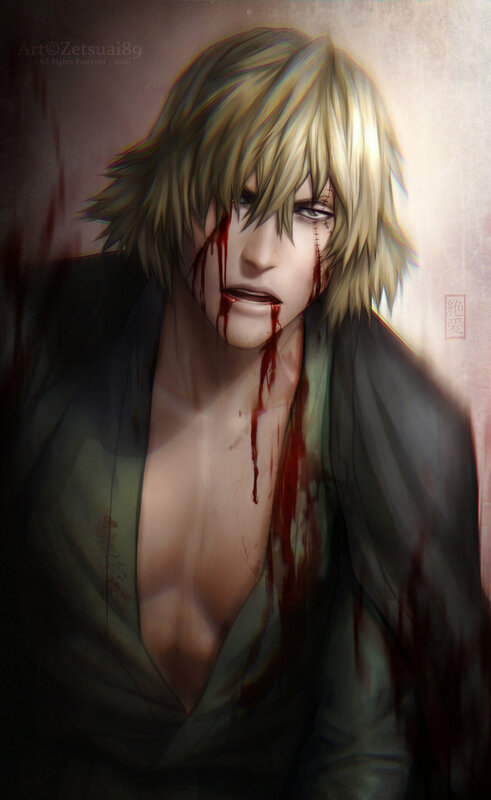 As shown in this image of Urahara Kisuke, by Zetsuai89, he already grows weaker and begins to bleed even with the help of his bankai, Kannonbiraki Benihime Aratame. If you like this artwork be sure to check out the artist, otherwise go ahead and share this page with other fans! The only problem I have with this fight is that it didn’t last as long as Pernida’s and Lille’s fight. And we didn’t get that good of an explanation of Kisuke’s Bankai. But I still liked that Kiuske, Askin, and Grimmjow are all basically dying. It builds up the tension. Hmm I think the only reason why Pernida’s was longer was because of her being an hand of the king. Askin is practically dead, Nel should have a hard time getting them back if she also gets poisoned. If you mean Askin’s fight against Ichigo’s Group than I agree his fight was long. His fight with Grimmjow was from 629 to 635. His fight with Ichigo was from 648 to 660. His fight with Yoruichi and Yushiro was from 660 to 663. His fight with Kisuke was from 664 to 666. I was mainly referring to his fight with Kisuke being short.